Welcome to the experimental Gruen Movement Map... a graphical front-end to the Gruen Movement Catalog. If you are trying to match your movement to one on the diagram, be sure and hold your movement dial-down and stem right. That is the orientation of ALL of the movements in this chart, and generally speaking on this site. Thumbprints are the small graphic in some of the movement squares bottom right corners. 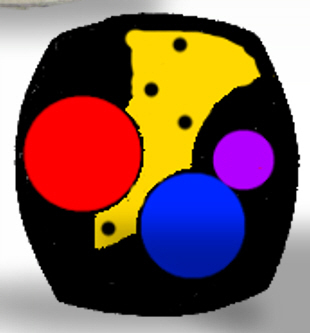 It's black with 4 shaded areas. You will also find a graphic representing the wheel train bridge shown in YELLOW. In it you'll find holes in the locations you will find jewel holes or screw holes in your watch's train bridge. You movement should also match the text-data shown with the movements which include the number of Jewels, Number of Adjustments, Precision or Guild quality stamps. Some of the movements you can click on to pull up detailed data (430, 431, 435, 440, 330), with the goal of providing detailed data on ALL of these movements. Tip - For the best experience, click the graphic in the bottom right corner that looks like a square. This will put the drawing in Full-Screen-Mode. Enjoy! I hope you find this useful. You can download a PDF of this map using these links. This information on Gruen Movements is provided free of charge to you, the Gruen collector. It took great effort and great expense to collect this data. Please don't simply scrape my chart for data and post it elsewhere. That's not asking too much, right? I appreciate the support I get from the Gruen community! Thank you for your encouragement.